I hope you have had the opportunity to go by the Court House and see the Veterans Monument. The construction has moved forward with the building of the footings, the cinder blocks, flat work and electricity. 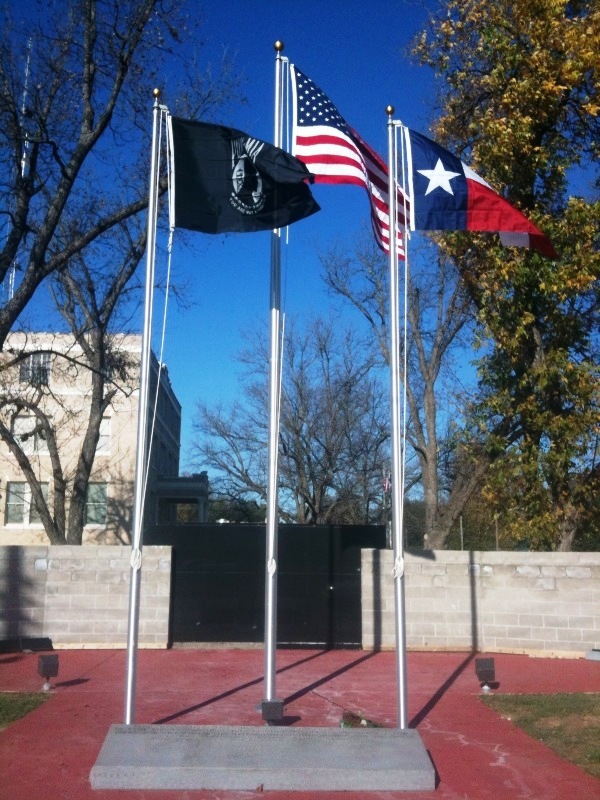 We have installed three flag poles. One for the American flag, the Texas flag, and the POW flag. Then the marker showing the veterans who made the ultimate sacrifice for our country was moved in front of the flags. But what is impressive is the black granite. The granite has been placed on the front and in the back. And it certainly looks great. It may appear that we have stopped work on the monument, but believe me we have not. Over the past three weeks we have been engraving the bricks. Thanks to Camp County Monument Company, they have engraved 600 sold bricks. The monument is designed to have 900 bricks on the front side. Since we have finished the engraving we have sold an additional 61 bricks. So we need an additional 239 bricks to complete the front of the monument. Therefore, if you want to honor a family member or friend now is the time. Once we have the 900 all other names will have to go on the back. The bricks will be placed on panels. Each panel will hold 150 names. Therefore, we have four panels that are complete. Next, the bricks will be laid out and organized to fit in the panels. All bricks will be reviewed for accuracy. We are trying our best to minimize our mistakes, but I am sure there will be a few. We need your help to finish this project. With Veterans' Day upon us, what could be a better way to honor a veteran than with a brick. So please tell your family and friends about the monument project. If you or a family member, relative, or friend have served in any service, you can honor them by purchasing a $50.00 brick. Forms are available at the local banks, Camp County Chamber of Commerce and at our website: www.ccal422.org. The American Legion appreciates the support of the community and will continue our service to veterans. If you need additional information, please contact me at (903) 856-6767.